Despite its heavy criticism, Batman V Superman: Dawn Of Justice has given fans one of the most widely accepted depictions of Batman to date. From his costume, attitude, down to his tech, Batman was arguably perfect. In the past, Photographer Clay Enos has provided fans with countless behind the scenes images for the controversial film, and once again he turns to social media to provided fans with yet another cool BTS item from the film, this time in the form of the initial concept pitch for the Batmobile as drawn on a napkin by production designer Patrick Tatopoulos. Seeing things like this tend to prove to fans that there is often a sense of vision for their beloved films. The Batmobile is a tremendously iconic part of Batman’s mythos, and seeing that the film production knew what the final product would look like from the very start goes a long way to distill that vision. 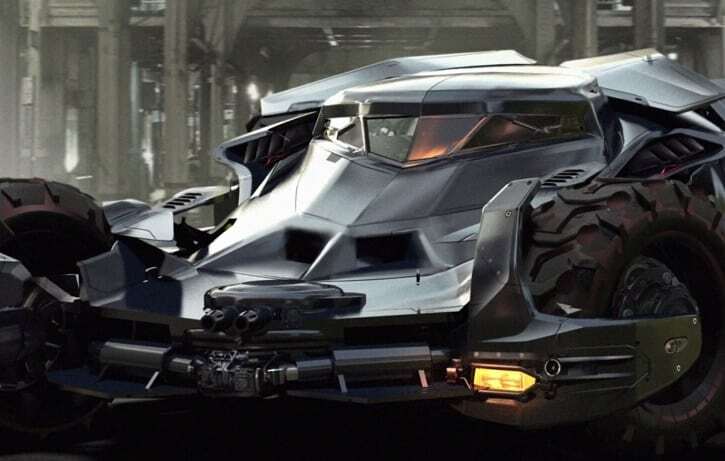 With the iconic car set to once again appear on the silver screen in August’s Suicide Squad, fans wont have to wait for long to see this best again. Batman v Superman: Dawn of Justice Ultimate Edition Blu-ray will hit stores on July 19, 2016. I am not sure the world’s greatest dectective takes, “if there’s even a 1% chance he’s our enemy,” as a certainty that the person is their enemy. Batman had plans in case other Justice League members BECAME his enemy, but he never treated them as enemies because there was a 1% chance it was possible. Aside from that? Loved Batman in the new movie. That’s an interesting angle from which to criticise this Batman. 1) Where in Batman V Superman was it ever stated that this Batman is “the World’s greatest detective”? 2) Batman in TDK series got fooled by villains in every single film: Rahz al Ghul, the Joker and Bane/Thalia al Ghul. I never hear people making this criticism of those works with this criteria. I don’t understand this obtuse comment at all. 1.) You must have never ever heard of Batman before the movies came out, or have never read a comic book before. Batman has been referred to as “The world’s greatest detective” for DECADES AND DECADES since the character was FIRST created. So it makes NO sense for you to try and refute this WELL KNOWN title for him. Just because they don’t say it in THIS movie, doesn’t mean you can just FORGET decades of history. Vegas82 was simply referring to Batman by own his many known popular nicknames. He said nothing about him being an actual detective in this movie, nor was he criticizing Batman’s detective skills in the movie. If you paid attention during BvS, you would see that they showed PLENTY of Batman’s awesome detective skills. So I have no idea why you’re upset that he refers to Batman as the world’s greatest detective. He IS a great detective, in both this movie and the comics. Everyone agrees. End of story. 2.) What does him getting fooled by villains have to do with anything?? I think you missed his point completely. He’s saying that Batman in the comics always knew there was a SMALL chance anyone from the Justice League could turn bad at any time. So in the comics, Batman took precautions IN CASE this ever happened (like hiding away kryptonite IN CASE Superman ever turns bad). In the movie however, Batman doesn’t wait to see if Supes will turn bad one day. He decides to just kill him based on that 1% chance that he MIGHT turn bad one day. And THAT is a HUGE difference between comic book Batman and this version of Batman. That was his point I believe. Nothing to do with his detective skills, and nothing to do with getting fooled by villains. It has to do with Batman CHOOSING to kill someone without knowing if they are really bad or good. Comic book Batman would wait until they actually do something evil before deciding to kill him. It’s a very fair and valid point. It’s weird for someone to say “you must’ve never heard of Batman”, & then forget ALL the aspects of tie character, from ALL iterations.. He wasn’t the world’s greatest detective in TDK trilogy. You do realize this is the Multiverse, yes? Not all aspects of any of these characters ring true in all iterations. And whether you or anyone else likes it or not, “Comic Book Batman” has killed, under equally justified circumstances. You started with “I do not understand this obtuse comment at all” and that statement pretty much sumarrised your competence or lack thereof in responding to it. You should have asked for clarity rather than spewing your ignorant guts all over the keyboard. In Batman V Superman it was never ever stated that he is the greatest detective in the World. So using that basis as a critique is a logical fallacy. Batman has been fooled several times in comics and film. So crtiiquing this Batman for being fooled is another strain of logical fallacy. If this is hard for u to understand that is an obtuse repudiation of your intelligence and I can’t help you. If you want information spoon-fed to you in a cheesy manner, I suggest you go watch a Marvel movie. BvS was meant for a much smarter audience, for people who are able to infer facts on their own from watching the movie. BvS gave plenty of scenes in showcasing Batman’s detective skills. He spends half the movie tracking down leads as Bruce Wayne. They make it a point to show that he’s five steps ahead of the entire police force and the US government. What more do you want? I think maybe you’re taking the title of “world’s greatest detective” a little too literally. They call Superman “The Man Of Steel”. It doesn’t mean he’s REALLY made of steel! And i feel silly that I even have to explain this to you. It’s just a nickname, meant to highlight a hero’s strength. The nickname “world’s greatest detective” was never meant to be taken so literally, even when it was first coined decades ago. It just means he’s a great Detective. And he was more than a GREAT detective in BvS as well. And it’s sad that you completely missed that part of the movie. And please stop with that nonsense argument that Batman gets fooled by villains all the time. THIS is by far, the silliest argument I’ve ever heard anyone make. If Batman didn’t get fooled by villains, there would be NO PLOT to the movie or comic! Batman has always gotten fooled by villains in nearly every Batman story. He gets fooled by villains throughout comic book history, even when he was directly called the “worlds greatest detective”. Falling into a villain’s trap has NOTHING to do with his detective skills! It’s called creating an adversary….creating an archenemy…..creating a situation that Batman has to think his way out of. Thats how you build a story! Batman always outsmarts the villain in the end, and that’s the point. Name me one movie where Batman did not eventually outsmart the villain in the end? Learning from his mistakes and using it to outsmart the villain in the end has always been a part of Batman’s genius. I’m still laughing that you even made that statement. That just because he gets fooled by villains, Batman is not a great detective. Haha Wow. Congratulations on making the dumbest Batman observation ever. What’s next? Aquaman is NOT a good swimmer? Lex Luthor is NOT a smart guy just because he ended up in prison? I suggest you rewatch BvS because half the movie went right over your head. Batman’s detective skills have always been a huge part of the character, and Snyder did a great job showcasing that in this movie. Nope there’s no need for a scene that says so and there’s no need to issue that as well. He’s a great detective, but the hyperbole is unwarranted. Why is the hyperbole unwarranted? If Batman is the greatest detective in the whole movie, and he’s the greatest detective in the entire DCEU so far, then why does he not deserve to be called the World’s Greatest Detective? (Especially since you finally understand that the nickname is just hyperbole, and not meant to be taken so literally). This is a nickname that has been associated with Batman for almost 80 years now. Nearly EVERY form of media featuring Batman has shown off his detective skills in some way, and BvS made it a point to do that as well. Can you at least come up with a better reason for why Batman does not deserve this title? “Getting fooled by villains” is not a valid reason, since that has absolutely nothing to do with someone’s detective skills. two days ago grey McLaren. P1 I bought after earning 18,512 Dollars..it was my previous month’s payout..just a little over.17k Dollars Last month..3-5 hours job a day…with weekly payouts..it’s realy the simplest. job I have ever Do.. I Joined This 7 months. ago. and now making over hourly. 87 Dollars…Learn. More right Here !tl858u:➽:➽:.➽.➽.➽.➽ http://GlobalSuperJobsReportsEmploymentsSwissGetPay$98Hour…. .★★★★★★★★★★★★★★★★★★★★★★★★★★★★★★★★★★★★★★★★★★★★★★★★★★★★::::::!tl858o….,.